Sentence of former Russian navy officer in theft case takes effect | Russian Legal Information Agency (RAPSI). ST. PETERSBURG, December 5 (RAPSI) – A court of appeals on Wednesday upheld the guilt of a retired captain of Russian navy Alexander Kushnaryov on stealing mortar, opening fire at servicemen and manufacturing explosives, RAPSI reports from the St. Petersburg City Court. In July, the Krasnogvardeysky District Court of St. Petersburg sentenced Kushnaryov to 10 years in prison and a 150,000-ruble fine ($2,300). 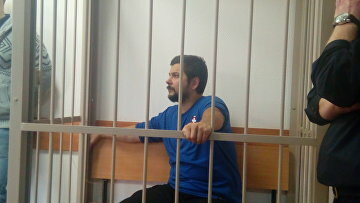 The court of appeals on Wednesday changed the sentence only in regard to the punishment ordering to recalculate the issued prison term taking into account the time Kushnaryov spent in detention, in accordance with a recently adopted law. And the sentence has become effective. In summer, it was found by court that Kushnaryov broke into a storage at a military shooting range and stole 82 mm mortar 2B14 valued at 750,000 rubles ($11,300) and stealing property valued at 90,000) rubles ($1,400 from Valkyriya patriotic youth organization. In addition, the defendant was charged with manufacturing and storing a frag mine as well as opening carbine fire at Russian servicemen. The latter incident was qualified as hooliganism. The defendant admitted stealing mortar and firing at servicemen but denied wrongdoing in relation to other charges. The case documents read that in 2015 Kushnaryov was found guilty of firing from a pneumatic gun at another person’s car. During the searches, law enforcement officers found unregistered weapons and ammunition. As a result, back then the defendant was sentenced to a 2-year suspended term and fined 30,000 rubles (about $500).